“For me, art is such a wide concept – anything can be art.” ~ Photographer Sebastiao Salgado in today’s Guardian. Now, there’s little more likely to mess with my matitudinal bliss than reading this first thing in the morning, and for a very good reason: it’s not true. What I think – hope- he means is that ‘anything has the potential to be regarded as, to become, art’. ‘Becoming’ is not ‘being’; it is a quite different proposition. One definition, for me, might be that, at least since Vasari, art is ‘special’; it is autonomous, an end itself, whatever ‘use’ it may be subsequently put to; design, on the other hand, is contingent: form is always subservient to function. Salgado goes on to say “…I saw the very furniture we used to have in our rooms on sale in a gallery [my emphasis]…it’s become an art object”. So, it had ceased to function as furniture at all and had become, like Duchamp’s Fountain, through its new ‘institutional’ context, something entirely other, something subject to completely different judgement criteria. 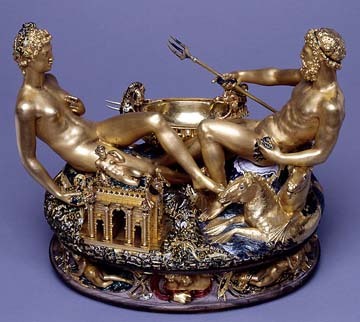 Compare Cellini’s Salt Cellar: it was last valued, according to Wiki, at $65,000,000; that has nothing at all to do with its salt-holding properties. Call me nit-picky but I believe it’s important to get language right. If ‘everything/anything is art’, then nothing is ‘art’; nothing is ‘special’, it’s just folk like me doing stuff more or less well, but all with an equally valid claim on your attention. If this were truly the case we in the West – I’m fully aware that ‘art’ is a construct which some other cultures do not buy into – would have to radically re-adjust how we relate to art and tear down the great cathedral we have made of it. That’s not about to happen; for one thing there’s far, far too much money involved. But what really, really gets my goat, and I am not an artist, is this: saying ‘everything is art’ misleads; it opens the door to complacency and laziness, to the notion that art is ‘easy’; most importantly, then, it diminishes those true artists who, through long years of hard graft and sedulous practice, constant striving to do better, give so much of themselves and bring so much pleasure and value to the rest of us. This entry was posted in art and tagged art by Glennie Bee. Bookmark the permalink. If anything is art, art is redundant. If anything can become art, artists are redundant? Thank you, Lucy! The whole idea does away with the notion of craftsmanship, I think. I'm with Hockers on this – Poetry AND Craft! It's 'X Factor Art' – anyone can do it. No, they can't. My point exactly – I'm an artist, my dog's an artist. Though she is trying, to be fair.